One important factor of student success is setting goals. I know many teachers, if not all teachers, set goals with their students. 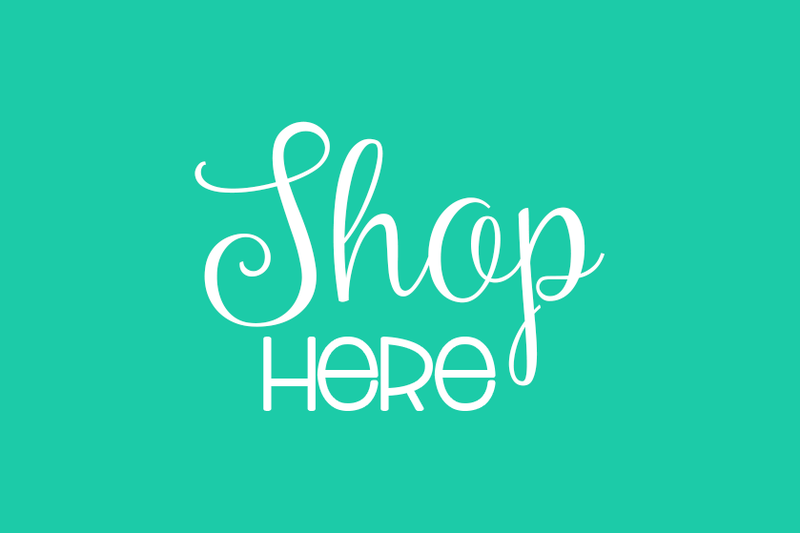 There are many different goals that you can set- individual goals, classroom goals, grade level goals, school-wide goals, etc. As teachers, we know that setting goals is important for student success. 1. Find the need. Students ask themselves, "What do I want to work on?" 2. Set the goal by defining the time frame and the goal. Students ask themselves, "What is a reasonable time frame to meet my goal?" 3. Determine how to meet the goal. 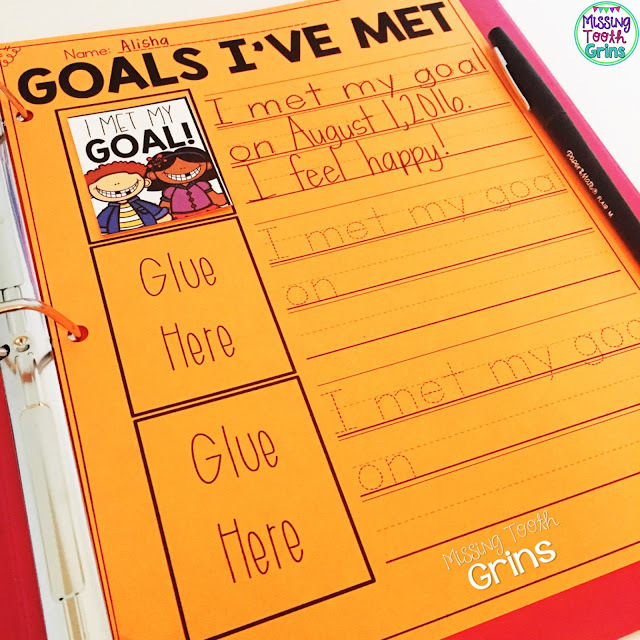 Students ask themselves, "What can I do every day to make sure I meet my goal?" 4. Track the goal. 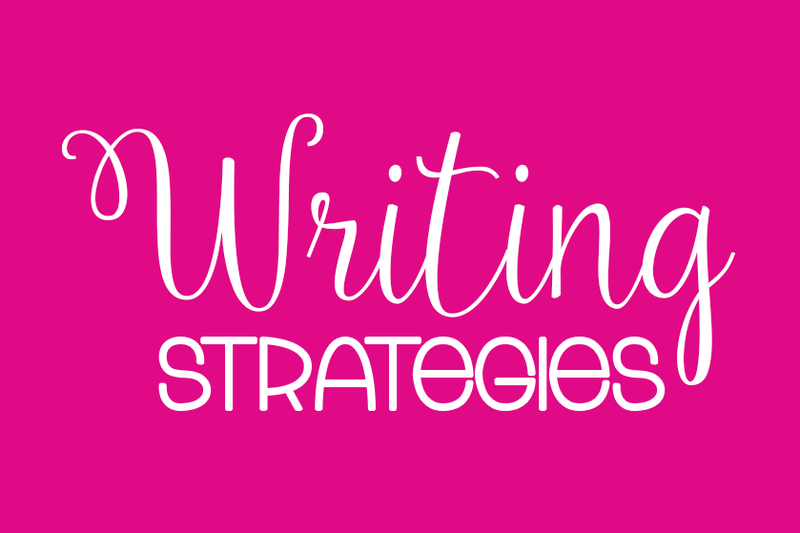 Students ask themselves, "How can I track myself while working towards my goal? What will hold me accountable?" 5. Meet the goal. Students say, "Yay! I met my goal!!" 6. Celebrate the goal. Students shout "Hurray!" because they meet their goals. Do you ever forget a step? I do. I am embarrassed to admit that I always sometimes forget to celebrate. Forgetting this step is unfortunate because it's probably the most important step in the entire process. We all know that students need praise. Think about it. Your child finishes all the vegetables on his/her plate, praise. A student gets a 100% on a spelling test, praise. Did you know that a "crucial benefit of celebration is its ability to overcome failure" (source)? 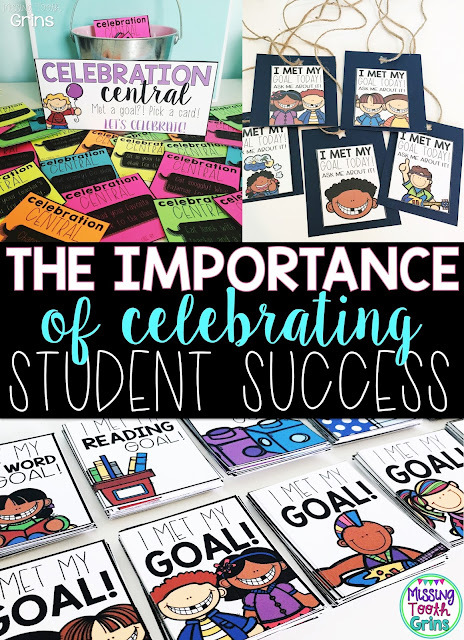 So, even when our students are taking longer to meet their goals, acknowledging everything they are doing to get there is just as important as meeting the goal at the finish line. And as teachers, that's part of our job... To encourage and celebrate them along the way. 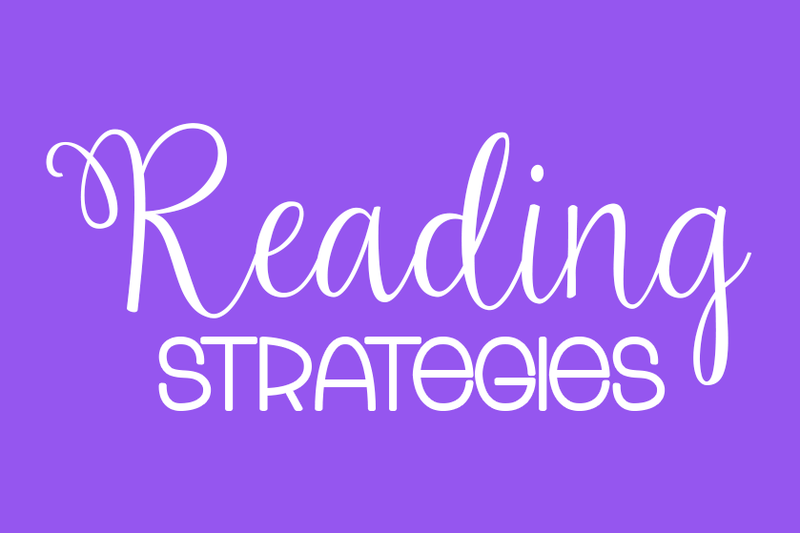 You may have one student who set a goal to jump two reading levels by the end of the quarter. Maybe that student isn't going to jump two, but acknowledging everything he/she has done along the way is important. Maybe they've been reading 30 minutes a night compared to the 10 minutes they were doing before. That's success right there. How to celebrate then? Well, in comes Celebration Central! I am really looking forward to introducing my kids to Celebration Central this year. This is how it will work. Every Wednesday, we will have our class meeting. During our class meeting, we will discuss our goals, what we've been doing to meet those goals, etc. 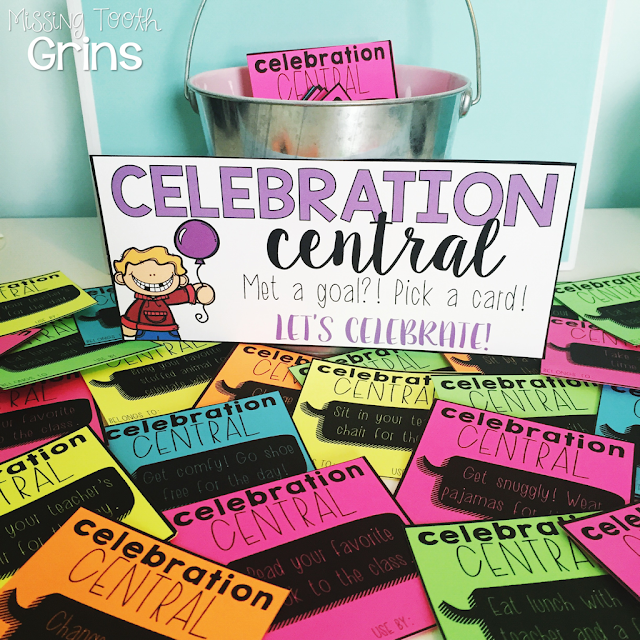 If anyone has met a goal, he/she will get to pick from the Celebration Central can. Inside the can are various coupons (such as "sit by a friend", "show and tell", etc.). The student can then turn that coupon in on a Friday. Another way to celebrate my students' meeting their goals is through brag tags. Now, I don't use brag tags in my classroom. Praise all of you that do because I think it's a wonderful reward system! However, these brag tags are just for meeting goals. Once a student meets a goal, they get the corresponding brag tag and then he/she glues it onto the data binder sheet in their data binder. 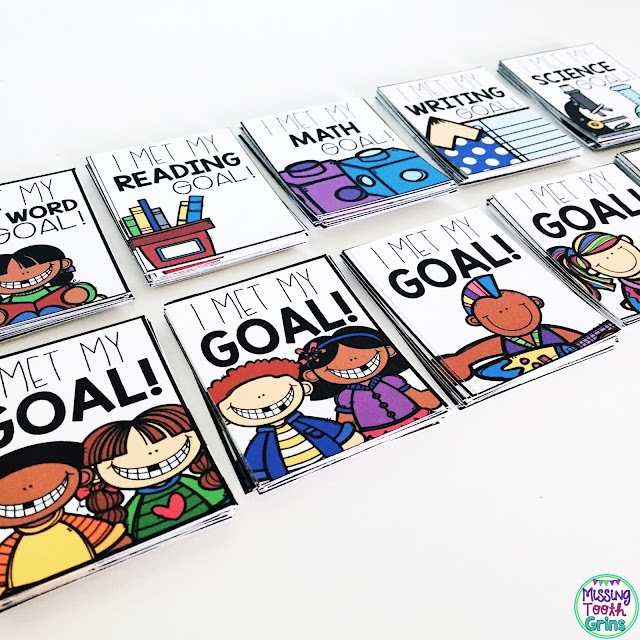 That way, students can showcase their goal brag tags in their data binder. Parents will be so happy to see these, I think! 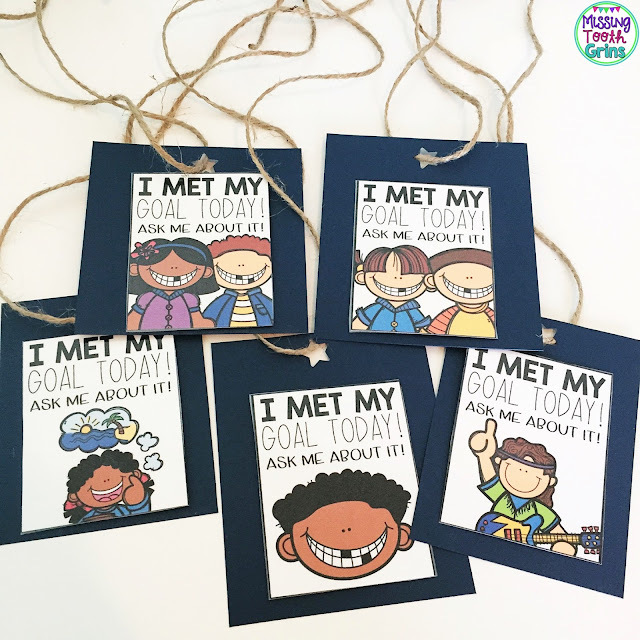 Students can also wear "I Met My Goal!" badges. 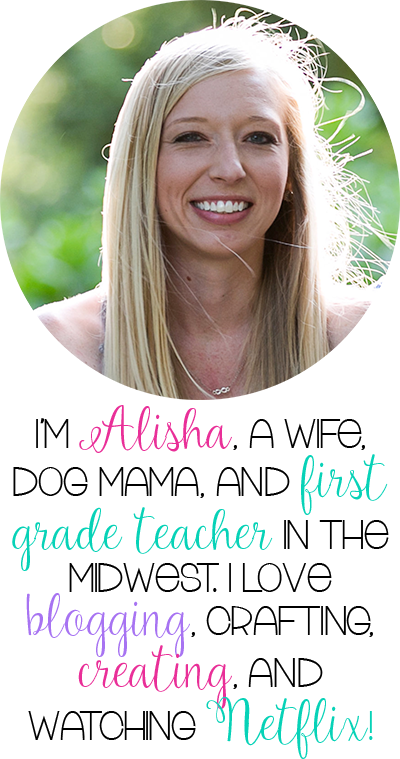 Or, when we set goals and have been working on conversing with others about them, students can wear the "Ask Me About My Goal!" badges!